NSU STEM Outreach aims to spark early student interest in science, technology, engineering, and mathematics. NSU's Dr. Alyssa Kiesow and NSU biology and biology education students teach and excite Aberdeen elementary school students about STEM. The goal of NSU STEM Outreach is to spark early student interest in STEM and encourage possible future study of or employment in STEM-related fields. Dr. Alyssa Kiesow, NSU associate professor of biology, and NSU students provide content and experiments to which students and teachers may not otherwise have access, and help create a hands-on learning environment full of exciting, new ideas. The program began in fall of 2011, when Dr. Kiesow was inspired to create change in elementary education. With her own children in school, she recognized a need for supplemental science, technology, engineering, and mathematics (STEM) instruction. Dr. Kiesow began by visiting her children’s classrooms to teach about STEM. As more teachers showed interest and the program grew, she enlisted the help of Northern students studying biology and biology education. How does NSU STEM Outreach Work? Each month, Dr. Kiesow and her team of biology and biology education majors go to elementary school classrooms to teach students about STEM in an exciting and hands-on way. NSU STEM Outreach has educated students in areas such as ecology, biology, physiology, physics, and chemistry. Past projects have focused on topics such as predator/prey relations, pollinators, DNA, the brain, density, and pH. STEM Outreach serves 11 classrooms in local schools, which include O.M. Tiffany Elementary School, May Overby Elementary School, Simmons Middle School, and Montessori School of Aberdeen. STEM Outreach also has worked with Aberdeen Central High School to provide a tour of NSU's cadaver lab. Dr. Kiesow hopes to continue to make the lab available as an educational opportunity for high school students. How Can I Bring STEM Outreach to My School? NSU STEM Outreach programming is available for elementary students on a first-come, first-serve basis. To request NSU STEM Outreach for your students, contact Ms. Michele Fritz or Dr. Alyssa Kiesow. To illustrate predator/prey relationships, students dissected owl pellets (owl waste), found animal bones, and created dichotomous keys. Students passed around real animal skulls, identifying each as predator or prey. We measured teachers' brain waves right in the classroom with electroencephalograms (EEGs)! Teachers wore swim caps to mimic a shaved head; electrodes were placed; and students could see brain waves on screen. We used models to discuss the brain's parts and functions. We introduced astronomy, discussing solar eclipses and constellations. Students made constellations and created stories to go with them. Students also created a large-scale model of the solar system and visualized distance using inflatable planets and yarn. Pollinators: we gave each classroom a monarch larva they could raise, tag and release. We showed different pollinators from NSU's insect collections, and emphasized the life cycle of the monarch butterfly. We also showed a film of NSU students working in our pollinator garden at NSU, and examined nets and kill jars. Past lessons have included showing real Madagascar cockroaches to help students understand biomes; helping students plate bacteria; and bringing African Clawed Frog (xenopus laevis) tadpoles to classrooms for students to raise. STEM Outreach provides a great opportunity for NSU students looking for in-classroom experience, volunteer work, or resume building. 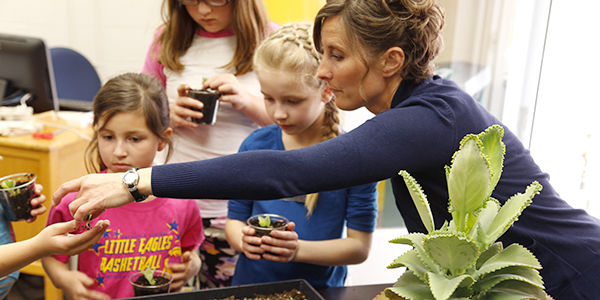 As a student volunteer, you'll work alongside faculty providing STEM education in classrooms. 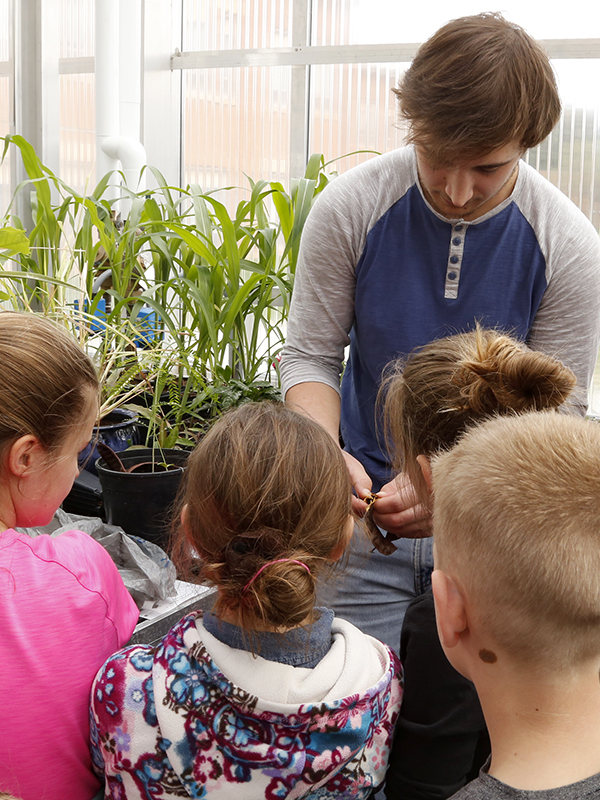 Biology education majors can use STEM Outreach to fulfill Biology 495 requirements. NSU biology and biology education students are crucial to our success! For more information, contact Ms. Michele Fritz or Dr. Alyssa Kiesow. I participate in NSU STEM because I want to promote an excitement for science in my students. I hope they see the passion from the college student volunteers and become lifelong science learners. I want kids to become entranced by how amazing science is at a young age so they are motivated to pursue STEM careers. I love seeing the pure enthusiasm and amazement they have when they get to see their teacher's brain waves or make their own compasses. I just imagine what some of these kids might be someday, and it makes me feel like I'm making a difference.